Glucerna 1.0 Cal is specialized nutrition with fiber for abnormal glucose tolerance. Glucerna 1 Cal is a reduced carbohydrate, modified-fat, fiber-containing formula clinically shown to blunt blood-glucose response in patients with abnormal glucose tolerance. 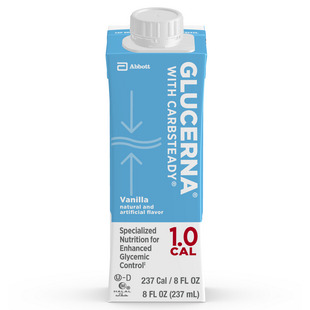 Glucerna drink provides only 34.3% of total calories as carbohydrate. This helps minimize glycemic reponse. It is ideal for those with type 1 and 2 diabetes. Also ideal for those with hyperglycemia resulting from metabolic stress, such as illness, trauma or infection. Can be used orally or tube feeding.